By E.J. Schultz . Published on June 12, 2017. A Smirnoff 'Made In America' out-of-home ad, as seen along the Metro-North commuter railroad in New York City. A Smirnoff 'Made In America' out-of-home ad, as seen along the Metro-North commuter railroad in New York City. Credit: Kate Kosturski via Twitter/@librarian_kate. Smirnoff is poking fun at Donald Trump's pledge to testify under oath amid allegations that Russia meddled in the U.S. election. 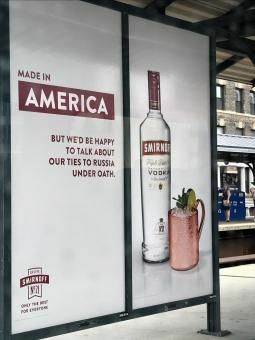 In new outdoor ads, the nation's largest vodka brand states that it is "made in America but we'd be happy to talk about our Russian ties under oath." The ads began popping up over the weekend and target small portions of the New York metro area, including a train station in Harlem, a Diageo spokesman confirmed. "Smirnoff has been made in America for more than eight decades. The recent interest in American-made products created the perfect opportunity to reinforce that fact and the brand's roots in Russia – with a wink and nod to current affairs," he stated. 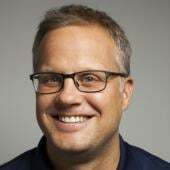 The agency behind the ad is 72andSunny. While the ad buy was limited, Smirnoff is getting worldwide attention on social media. This tweet below, for instance, was retweeted by Diageo's North American chief marketing and innovation officer, James Thompson. The ad is a reference to Trump's assertion last week that he was "100 percent" willing to testify under oath about his conversations with James Comey. The remark came a day after the fired FBI director testified before a Senate committee amid investigations into allegations of Russian meddling in the presidential election. Comey alleged that the president asked for loyalty and pressured him to back off the investigation into former national security adviser Michael Flynn. Smirnoff was founded in 1864 by Piotr Arseneevich Smirnov and before long, "he became one of the most famous vodka makers in Russia," according to the brand's web site. Bottles of Smirnoff sold in the U.S. are made at a plant in Plainfield, Illinois.